Saratoga Springs Plastic Surgeon Honored as 2019 "Top Doctor"
Dr. Steven Yarinsky is named a 2019 Top Doctor by Castle Connolly Medical Ltd. in the Albany, Capital District and New York metropolitan areas. 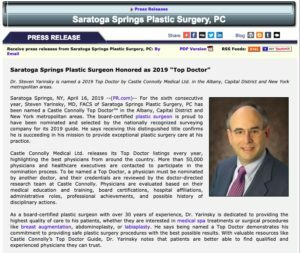 Saratoga Springs, NY – For the sixth consecutive year, Steven Yarinsky, MD, FACS of Saratoga Springs Plastic Surgery, PC has been named a Castle Connolly Top Doctor™ in the Albany, Capital District and New York metropolitan areas. The board-certified plastic surgeon is proud to have been nominated and selected by the nationally recognized surveying company for its 2019 guide. He says receiving this distinguished title confirms he is succeeding in his mission to provide exceptional plastic surgery care at his practice. Castle Connolly Medical Ltd. releases its Top Doctor listings every year, highlighting the best physicians from around the country. More than 50,000 physicians and healthcare executives are contacted to participate in the nomination process. To be named a Top Doctor, a physician must be nominated by another doctor, and their credentials are reviewed by the doctor-directed research team at Castle Connolly. Physicians are evaluated based on their medical education and training, board certifications, hospital affiliations, administrative roles, professional achievements, and possible history of disciplinary actions. As a board-certified plastic surgeon with over 30 years of experience, Dr. Yarinsky is dedicated to providing the highest quality of care to his patients, whether they are interested in medical spa treatments or surgical procedures like breast augmentation, abdominoplasty, or labiaplasty. He says being named a Top Doctor demonstrates his commitment to providing safe plastic surgery procedures with the best possible results. With valuable resources like Castle Connolly’s Top Doctor Guide, Dr. Yarinsky notes that patients are better able to find qualified and experienced physicians they can trust. Dr. Yarinsky is a board-certified plastic surgeon offering a wide range of cosmetic surgical procedures at Saratoga Springs Plastic Surgery, PC. After earning his medical degree from SUNY Upstate Medical Center, Syracuse, Dr. Yarinsky continued to Ohio State University Hospital, Columbus to complete his five-year general surgery residency. He then trained in a Cosmetic and Reconstruction Surgery residency at the Medical College of Ohio. Dr. Yarinsky dedicates over 150 hours of continuing medical education every three years. He also stays active in several medical associations, including being a member of the American Society for Aesthetic Plastic Surgery, a Diplomat of the American Board of Plastic Surgery, and a Fellow of the American College of Surgeons. Dr. Yarinsky is available for interview upon request. To learn more about Saratoga Springs Plastic Surgery, PC, visit yarinsky.com or facebook.com/DrYarinsky.